CT Retrofit Energy Solutions installs Fujitsu mini-split heat pumps for residential homes throughout Connecticut. If the time has come to replace your old home heating and cooling system a ductless split system is definitely worth considering. These systems are relatively new but rapidly gaining in popularity and they can provide both heating and AC for year–round indoor comfort. 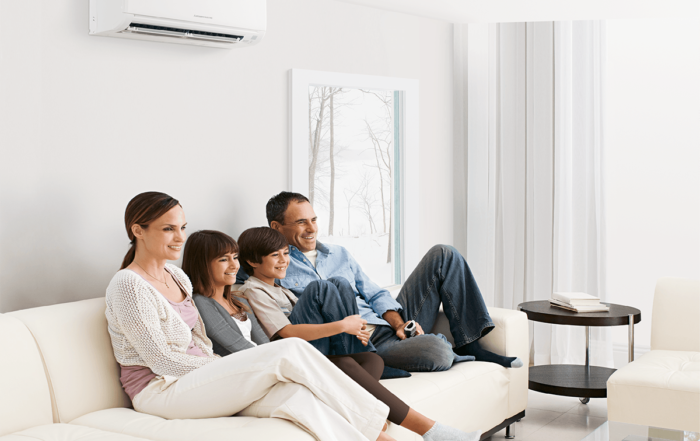 Fujitsu is a leader in ductless mini split technology and Connecticut Retrofit is proud to offer products from this reputable manufacturer to customers all Connectciut. We know that quality and consistency are important to you and that’s why we only carry what we feel are the best products on the market. Ductless splits may not be the right solution for every home, but they do offer many advantages. When you decide to go with a ductless split system, make sure the one you choose is appropriate for your particular needs. We can help you with that part of the process, and we also offer full ductless split installation, maintenance and repair services. So what is a ductless split system anyway? As their name suggests, these systems are made up of multiple parts. There is an outdoor compressor unit and one or more indoor units. These component parts are linked together by refrigerant lines which supply the indoor units with coolant from the outdoor compressor. This setup is similar to that of a traditional air conditioning system or heat pump, but the main difference between these systems and the split models is the absence of air ducts. Other forms of home heating and cooling systems require a system of air ducts to get the heat from one area of the house to another. Ductless splits, however, are able to produce the heated or cooled air in the in–room units. There are quite a few benefits to ductless systems. First of all, ductless splits can be installed in more areas than traditional air conditioners. That’s because some spaces are simply too small to allow for enough air ducts. If space is at a premium in your home, a ductless split system may be the solution. In a home that doesn’t have ductwork already in place the installation of a ductless split system will be much cheaper than that of a more conventional ducted system. That’s because installing ducts is time consuming and labor intensive. The refrigerant lines required by a ductless mini split system are much easier to put in. Fujitsu also offers both single zone and multi zone ductless split systems that allow you to control the indoor temperature of your house very precisely. With these systems, you can maintain one temperature in your bedroom, another in your kitchen and a third in your living room. This not only increases the comfort level in every area of your home, but it helps you save energy by heating or cooling only the areas you choose. Choose CT Retrofit for your Mitsubishi Ductless AC & Mini-Split installation in CT.